declined 3% Year-on-year with 386 million units shipped. On the top the situation is the same – Samsung leads, followed by Huawei and Apple. 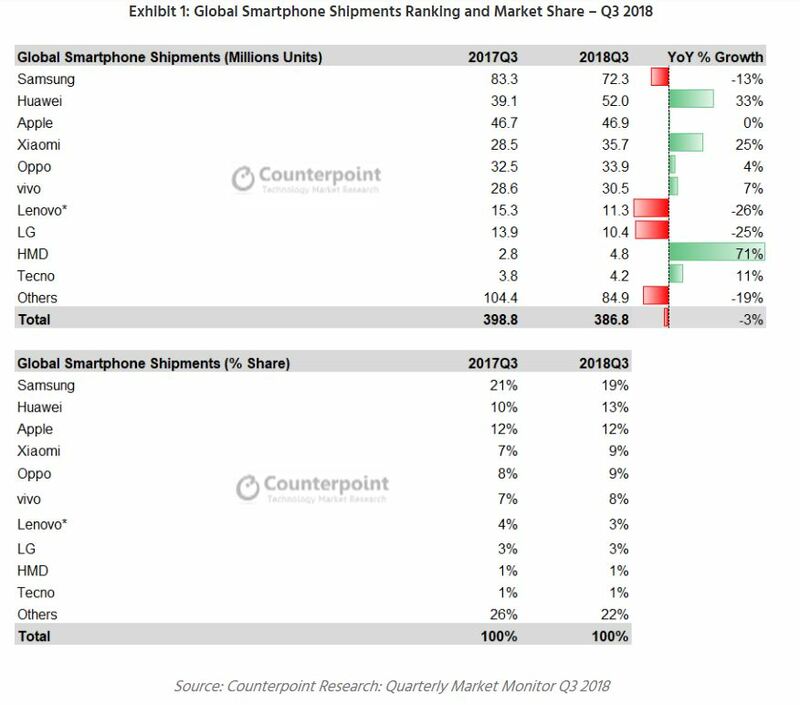 The interesting thing is that Samsung shipments declined now in the last 4 quarters, while Huawei posted a 33% YoY growth in Q3, which could signal that we may soon have a new smartphone king. 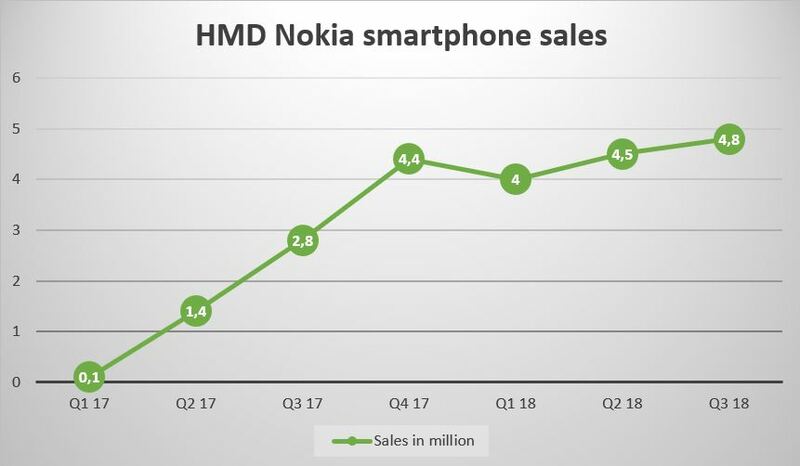 HMD Nokia smartphones also did well in Q3 2018. HMD shipped 4.8 million Nokia smartphones, a growth of 71% compared to Q3 2017, when the Company shipped 2.8 million smartphones. This number was enough to retain the No.9 spot with a market share of 1%. The No.8 on the list is LG with more than 10 million in shipments, so to go forward HMD has to practically at least double its shipments. In the first 9 months of 2018, the total shipment of Nokia phones was 13.3 million, compared to 4.3 million in First 3 quarters of 2017. Keep in mind, in 2017 HMD sold just the Nokia 6 during Q1 (only in China), while the 3, 5 and 6 started appearing in global markets in late Q2 2017. Data about the feature phone shipments hasn’t been released yet, and we will cover it as soon as it is out. “Nokia HMD was one of the fastest growing smartphone brand in Q3 2018, it also ranked second in-terms of feature phone shipments for the quarter. The brand has been doing well since its re-birth by providing handsets with better built quality, frequent new launches and pure android experience. It has been rapidly expanding its portfolio with a presence in almost all price segments. Rumours: #Nokia D1C pricing revealed? !